Eddie Hinton was an American guitarist, singer and songwriter. Eddie Hinton was born in 1944 in Jacksonville, Florida and grew up in Tuscaloosa, Alabama, where he was in a band called The Minutes. They were popular locally, but after several years on the road with them Hinton quit and moved to Muscle Shoals in 1967, to find work as a session guitarist. He worked mostly at Quin Ivy's Quinvy studio, not just as a guitarist but as a songwriter and producer, usually in partnership with Marlin Greene. One of their most successful songs from this period was the soul ballad "Cover Me", which was a modest hit for Percy Sledge. Another well known song of his, "Breakfast In Bed", was written with Donnie Fritts and was recorded by Dusty Springfield for her Dusty In Memphis album. By the 70s Hinton had become the regular lead guitarist at the Muscle Shoals Sound Studio. As well as his talents as a songwriter and guitarist, Hinton was a brilliant blue-eyed soul singer, much respected and admired by those who worked with him in the music business. Many thought he could have been a star, but unfortunately it never happened, and his debut solo album would have to wait until 1978 to see release. If he had released an album earlier in the decade it surely would have been fantastic, and recently Zane Records have released a series of CDs compiling all his demos and previously unreleased recordings from this era. This it the first of them, and features nineteen excellent songs which mostly showcase his talents as a singer. Some excellent southern Soul and R&B music. Includes his own version of "Cover Me". 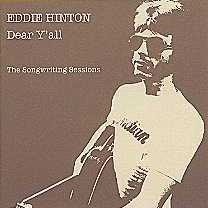 All the songs are originals, with the exception of a rootsy Chuck Berry cover and one song written (and produced) by Dan Penn - "Dreamer" was the b-side of a 1969 solo single (it was also recorded by Patti LaBelle & The Bluebelles), and is perhaps the best example here of Eddie Hinton as one of the greatest white soul voices. never ever heard of him, but this is awsome! This is also a typical response i have with so many of the fabulous postings you have assembled here. Thank you for your efforts and Merry Chrsitmas to you and your family! Eddie is the best!Love the blog!! This is exactly why I follow your blog. You provide music that I may not have ever heard but am willing to try. Thanks so much for all you do and keep up the great work. Love the whole Muscle Schoals sound! Wow! You've done it yet again. Thank you very much for the Eddie Hinton. Haven't visited here in a long while. Thanks so much for this and all the other great stuff you post.